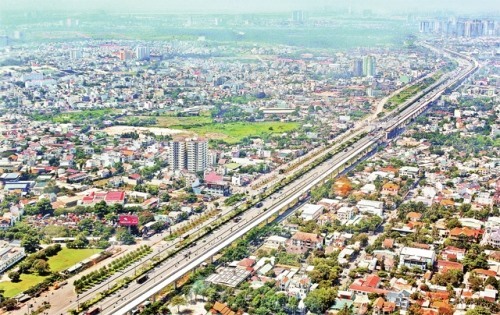 HCM City – HCM City’s growth rate maintained a steady pace for the first four months of the year. The city’s total State budget collection was VNĐ125 trillion (US$5.5 billion), nearly 36 per cent of the entire year’s target and an increase of 22.4 per cent in comparison with the same period last year. Total export turnover of enterprises in the city was around $10.9 billion, an increase of 16.9 per cent compared with the same period in 2016. Export value increased in various markets, including Singapore with 91.5 per cent, Malaysia 86 per cent, Myanmar 66.7 per cent, Spain 65.2 per cent and Australia 59.7 per cent. But lower export figures were recorded in the Philippines, Indonesia, Cambodia and Canada. Exports for rubber, coffee, computers and electronic equipment, and transport vehicles remained high, increasing by between 25.7 per cent and 70.9 per cent. Import value was $13.1 billion, a year-on-year increase of 20 per cent, especially in raw materials and equipment for production activities. Electronic appliances and equipment saw a growth rate of 44.8 per cent, metal 29.7 per cent, and automobile equipment 21.4 per cent. The service and retail sector expanded by 10.6 per cent (compared to 7.5 per cent a year earlier) and industrial production increased by 7.1 per cent (6.2 per cent a year earlier). The city’s four key industries namely engineering and automation; electronics, chemicals, rubber, plastics; and food processing, continued to perform strongly with the growth rate of nearly 10.25 per cent. The result was because they expanded market shares, invested in technology, and improved quality and competitiveness. “Engineering and automation grew by nearly 19 per cent with domestically made machines whose production costs are equivalent to 60 – 70 per cent of that of the imported ones,” Nguyễn Hoàng Minh, deputy director of the municipal Planning and Investment Department, said at the meeting held yesterday (April 27). Meanwhile, the electricity sector intensified investments in completing its national grid for production activities and daily use which was estimated at 7.36 billion kWh, an increase of 1.9 per cent over the same period last year. The electricity leakage was about 5.28 per cent, lower by 0.52 per cent than last year. And electricity savings amounted to 141 million kWh, or 39 per cent of the yearly plan. For the first four months, a total of VNĐ964.3 trillion ($43 billion) was spent for construction, an increase of 8.1 per cent year-on-year. Around 12,100 new companies with the legal capital of VNĐ214.5 trillion ($9.5 billion) received business licences in the first four months of the year, a year-on-year increase of 59.1 per cent. The city attracted nearly $896 million in FDI, up 43 per cent. During the first four months, the city provided employment for 98,600 people, 35 per cent of its yearly plan, up 0.61 per cent.